BMW Group Research and NXP Semiconductors have unveiled a prototype of a car key that allows car owners to make contactless payments. Powered by NXP’s SmartMX security chip, people will be able to use the key for transactions such as shopping, public transport, parking, and bridge and road tolls – for the first time – in any BMW vehicle they own or drive. The key also includes personalized access control. NXP plans to demonstrate the car key prototype at its booth during the CARTES & IDentification show in Paris Nov. 14-16. By turning the car key into a personalized credit card, many additional mobility scenarios become possible. The future consumers will be able to securely gain access to personal data and be authorized for personalized in-vehicle online services in any BMW vehicle they own or drive. The personal credit card key may also be temporarily registered with other cars. Renting or sharing cars becomes convenient, even more as personalized authorizations and service settings can be automatically activated in these vehicles. Moreover, when public transport tickets are loaded to the personal key, this device becomes a companion for seamless mobility. 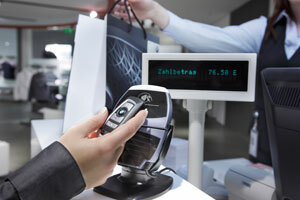 “Together with BMW, we are underlining our global leadership in remote key-less vehicle ‘entry and go’ and contactless identification, by delivering a compelling contactless application that will continue to drive innovations in smart card banking and the automotive industry,” said NXP’s Marc de Jong, executive vice president, business unit automotive and identification. Featuring smaller antennas than standard smart cards, NXP’s SmartMX P5CD081 series can be integrated into a broad range of different form factors. The dual-interface chip is also EMV-compliant.